Motor: 30 to 40 H.P. Heavy duty double pillar type hand driven screw presses epecially designed to draw a numerous sheet metal articals, utensils, hollow-wares, containers, bottle tube caps, etc, and also useful for embossing, punching, numbering, pressing, etc. Complete with fly wheel and handle. It is used for de-watering of the handmade sheets, formed on the auto vat driven by an electric motor. A uniform pressure is exerted on the pulp sheets, placed between the platens. The press is also designed as per the customer's requirement for different sheet size to compress the paper for quick drying. We are offering high grade Screw Press. 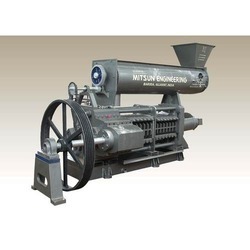 Being one of the trusted organizations in the market, we are indulged in providing a wide range of Screw Press Machine. We offer our clients an optimum quality range of Dewatering Screw Presses which are manufactured using the best grade basic material and superior technology in synchronization with the set industry standards. Owing to their robust construction and easy maintenance, these screw presses are widely demanded among our clients. The juice extractor machine is suitable for extraction of juice from fruits. The screw press juice extractor machine is provided with screw and perforated screen assembly. The pressure for extraction can be adjusted in the pressure plate assembly. Thus juice and the waste is separated in this commercial juice extractor. Capacity ranging from 1000 kgs per hr upto 3000 kgs per hr can be provided. Manufacturer of Disc Friction Screw press machine used in manufacturing clay tiles, refractory bricks, Clay bricks etc. Used in manufacturing ceramic items. We are Manufacturer, supplier and exporter of Friction screw Press. We strive hard to meet international standards and our products provide complete customer satisfaction .These machines are perfect at producing at high speed. Counted amongst the most eminent providers of rugged items capable of bringing a revolution in the competitive market. 1, 200 Ton closed fie forging press screw press to forge Aluminum Steel Titanium and Super Alloys.